The year 2018 will see the 52nd annual Kwanzaa, the African American holiday celebrated from December 26 to January 1. It is estimated that some 18 million African Americans take part in Kwanzaa. Kwanzaa is not a religious holiday, nor is it meant to replace Christmas. It was created by Dr. Maulana “Ron” Karenga, a professor of Black Studies, in 1966. At this time of great social change for African Americans, Karenga sought to design a celebration that would honor the values of ancient African cultures and inspire African Americans who were working for progress. Kwanzaa is based on the year-end harvest festivals that have taken place throughout Africa for thousands of years. The name comes from the Swahili phrase “matunda ya kwanza,” which means “first fruits of the harvest.” Karenga chose a phrase from Swahili because the language is used by various peoples throughout Africa. 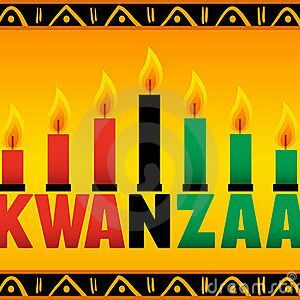 Each of the seven days of Kwanzaa honors a different principle. These principles are believed to have been key to building strong, productive families and communities in Africa. During Kwanzaa, celebrants greet each other with “Habari gani,” or “What’s the news?” The principles of Kwanzaa form the answers. Especially at karamu, Kwanzaa is celebrated with red, black, and green. These three colors were important symbols in ancient Africa that gained new recognition through the efforts of Marcus Garvey’s Black Nationalist movement. Green is for the fertile land of Africa; black is for the color of the people; and red is the for the blood that is shed in the struggle for freedom.